The world faces a crisis. In the time it takes you to read this article, a species will go extinct. Three more will go extinct in the next hour, 30,000 in the year. Scientists call this crisis the sixth great mass extinction event, and because of the threat it poses to global biodiversity, it is as great a threat to human well-being as climate change. The causes of this extinction event are quite clear: humans are out-competing all other species for scarce resources on a finite planet. Whether competing for clean water, undisturbed habitat or food sources, human population growth places inexorable pressure on the survival of all other species. That pressure is slowly driving other species to the brink and beyond. As the number of other species pushed into extinction grows, the resilience of global systems is reduced and more resources are taken from the poorest segments of the global population. 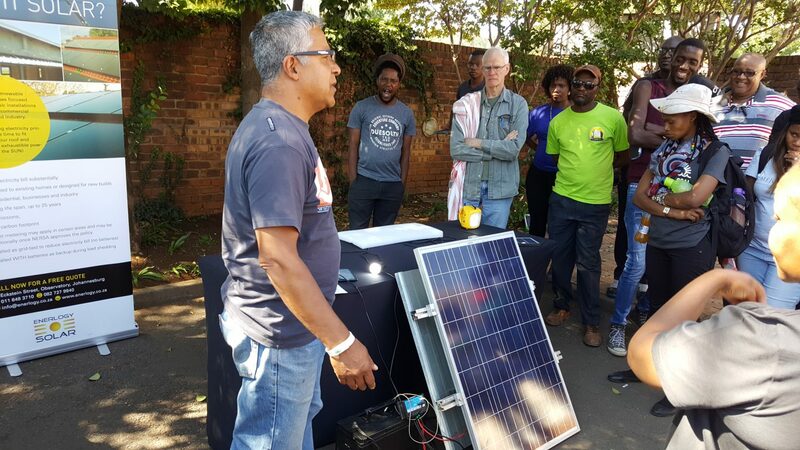 Yet the solution to the biodiversity crisis also presents an opportunity to provide development opportunities to those who are most in need of aid. 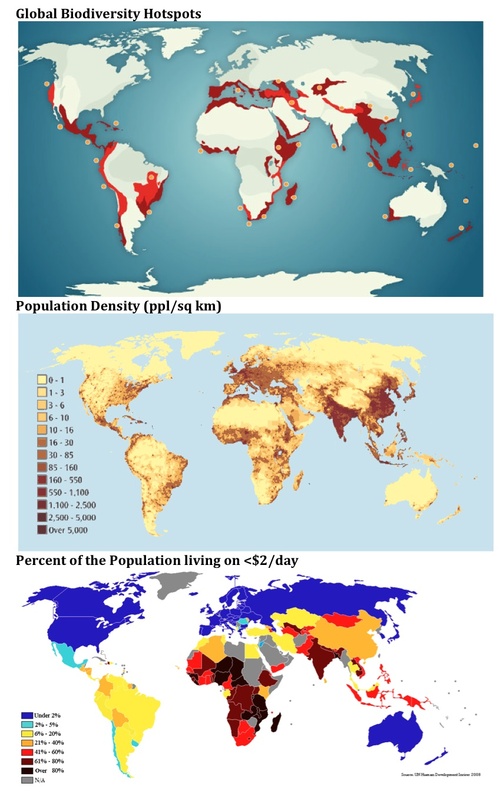 The three maps to the right illustrate the overlaps between global biodiversity hot-spots, human population density and the countries with the highest percentages of the population living on less than $2/day. As can be seen, many of the most important areas for conservation are also among those most threatened by a fast-growing impoverished population. 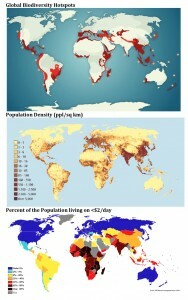 Scientists have long recognized that there is a relationship between important conservation areas and poor populations. However, a new report (PDF) in BioScience now offers empirical evidence which attempts to quantify the benefits to both biodiversity and the global poor from biodiversity conservation. Aside from the reasons illustrated by the maps above, the report points out that, for many of the global poor, declines in biodiversity are a direct threat to their well-being because so many of their subsistence needs are met by the biomass around them. Declines in this biomass, or its diversity, reduce their already scarce resources. The new study examines the overlap between areas targeted for biodiversity conservation and areas that provide critical ecosystem services (carbon sequestration, water purification, etc.). It finds that preserving the top 25% of highly biodiverse regions in the world would simultaneously preserve 39% of the world’s ecosystem services potential. If the measure of ecosystem services is shifted from potential to realized services — those services from which people are currently deriving value — the amount preserved increases to 50%. Perhaps even more critically for those whose goal is poverty alleviation, the study finds that 79% of essential services provided by ecosystem services originate in areas that have above average importance for conserving biodiversity. Not only does protecting biodiversity directly benefit the poor by protecting the areas that provide them with essential services and resources, these areas could prove monetarily lucrative. Some of these ecosystem services are valued at as much as $1024 billion by the global economy. If the local owners of these areas were compensated for the full value of the services their lands provide, 300 million of the world’s poor could earn an additional $1/day, a small increase that could mean a world of difference. It has been obvious for some time that fighting poverty and preserving biodiversity must go hand-in-hand because poverty and biodiversity share geographies. It follows, then, that conservation and development projects should be integrated. 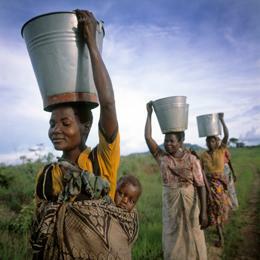 Many conservationists believe that conservation cannot be successful without the support of local populations. The increasing recognition of the importance of ecosystem services provides another reason to integrate these projects: equity. The world’s poor are disproportionately harmed by the destruction of biodiversity and elimination of ecosystem services; it stands to reason that they should benefit from the preservation of these same systems. Including these local populations in projects to conserve the world’s biodiversity not only protects other species, but also ensures the improvement of the lives of millions of human beings. If the current global wave of extinctions is allowed to continue, the developed world will not be first to suffer the effects of declining biodiversity. Instead, those most affected will be those who are already struggling to survive. Integrating the conservation of biodiversity with development projects increases the funding available for these projects while insulating those who depend on the world’s ecosystems from those who are destroying them.